Paw Patch Quilt Shop's Blog - Local Ohio Quilt Shop! Paw Patch Quilt Shop's Blog! Stay tuned to whats going on with Paw Patch & Learn some new skills! inspired by our leader, Mark Dunn’s, passion for textiles and love of color! only these 12 Bella Solids and a piece of each must be used. Any type of piecing, quilting, embroidery, etc. may be used to create your masterpiece. Make sure you sign up for the Challenge Here! All quilters who are inspired by the love of textiles and color and would like to create a contemporary art quilt using these 12 Bella Solids. Quilt must contain only these 12 Bella Solids shown above and a piece of each must be used. Any type of piecing, quilting, embroidery, etc. can be used to create a masterpiece. Quilt(s) must measure 72″x 90″. Quilt(s) must be an original design. Quilt must be quilted. No quilt tops will be accepted. Quilt must be labeled with Maker’s and Quilter’s name, city and contact information. Top 3 National winning quilt(s) will become the property of Moda Fabrics. No limit to number of entries. International entries will be accepted. Digital image of quilt must be received no later than Tuesday, September 12. All the entries will be judged. Six finalists will be chosen. Finalist quilts must be mailed at owner’s expense to Moda home office in Dallas for final judging. Moda will contact the 3 final winners on October 20th. The quilts will be on display in the Moda Fabrics booth during Fall Quilt Market, 2017. The prize money will be considered the purchased price of the three winning quilts. They will become the property of Moda Fabrics. * Purchase Awards – Quilts become the property of Moda Fabrics. We are so excited to finally start Row by Row for the second time. Last year we meet so many new people and this year will be another exciting year to meet people from all over the country and maybe the world. We have three quilts this year. A barn quilt with the famous sheep from last year and two quilts that have the famous OHIO, one Patriotic and the other Buckeye! I will start posting where everyone is from is you all would like! Let me know! Re-Organizing The Oak Room at Paw Patch! Paw patch is online now which I all hope you know. If you do not know who we are, we are a family ran quilt shop Grandmother (Jean Hunter), Mother ( Carol Skinner) and then there is me Granddaughter ( Samantha Ramsier). 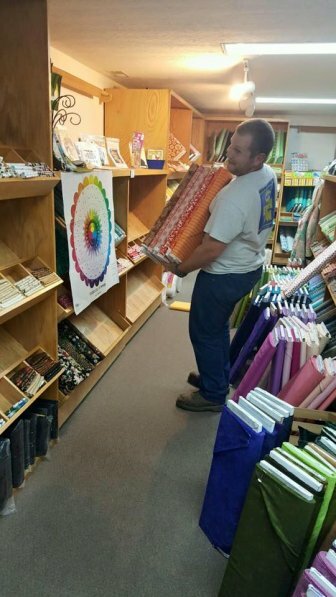 We love our quilt shop and we love having the quilt to share with all of you. I am in charge of the online store and managing the shop office. We are so close to having the POS system up and running and so this weekend we re-organized and got all the fabric updated and barcode for the system. Thanks to my husband and Joanne we were able to move all the fabric and entered. 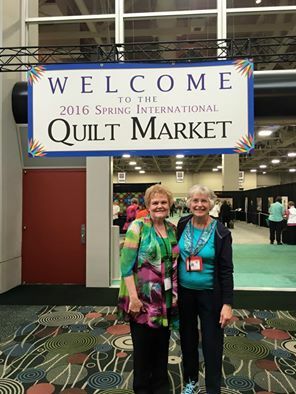 This year is an exciting year for us with quilt market, we actually sent two of our employees to quilt market! Grandma (Jean) , Mom (Carol), and I (Sam) were unable to go due to vacation and health reasons. We sent Chris and Linda and they were so very excited. They have sent back so many pictures of all the people they are meeting! We cannot wait to see all the new projects and fabric they have bought! Here they are at Quilt Market and here are some pictures! Linda won a prize at the Amy Butler's Class! So you have cut the fabric like the pattern has said to, and then you sewed all the pieces back together into an amazing creation. So you have your top done…..what now? Ohhh nnooo now I have to figure out how to make this quilt top into a finished quilt!! So hopefully you went to PAW PATCH QUILT SHOP and bought your batting (which is the white fluffy stuff/wadding) and also the backing for the quilt! Before you leave our shop pick up some “Quilt Basting Spray”. Or if you are at home you can order the basting spray online……(IT IS ONLINE RIGHT NOW FOR 25% OFF) and we will ship it to your door. Now you are ready to layer your quilt! You can use basting spray when hand quilting, but spray is ideally for machine quilting. Options for basting: hand quilting, hand baste. Machine quilting, pin or spray baste. Step 2.) Open doors or windows so that you do not breath in a lot of the spray. spray you want to hold the can 6-8 inches above the fabric and spray from left to right from one end of the quilt to the other. Let it set in for 5 minutes. After 5 minutes only pull back the batting and start in the middle rubbing out the wrinkles…it’s like putting up wallpaper. Make sure everything is smooth. Now you can repeat the spraying instructions on the next layer. Once you let the spray set in for 5 minutes pull back the quilt top. Now this step you want to take your time and make sure your seams are straight and there is now wrinkles. It is best to start in the middle and work your way to the edges. Now you should have one half of you quilt basted! Woohoo! Step 4.) Repeat step 3 to the other half of your quilt making sure in each layer there is no wrinkles! Step 5.) Now the whole quilt is basted…what a relief! So now you can trim the excess batting and backing but leave about 3-5 inches all around. Once you have trimmed the excess, now you need to fold up the edges to the front edge. Great you made it through the quilt basting process, it’s not that bad once you know how to do it! A Funny one for Tuesday! Happiness is making it around that last corner, but what “corner” could that be! In life we have many corner to get around and when we do make it around those corners our lives are fully of Happiness! The same is true with quilting. Doing binding can be hard but when they are done right with the right equipment it can cause happiness! Click Here For The Clips! At Paw Patch we love our Creative Grid rulers! The reason we love those rulers so much is because they a very easy to use. The number one reason they are easy to use is because they are made out of clear plastic and the ruler lines and numbers are black. Another reason they are so easy is because they have grippers that helps keep the ruler still on the fabric and will not move while you try to cut. The number one reason Creative Grids are the best is because they have so many rulers and each ruler has a QR Code. Download the app QR Reader and scan the box of the code on any Creative Grid Ruler and it will pull up all the videos that will show you how to use the ruler properly! CLICK HERE TO SEE OUR CREATIVE GRID RULERS!